Our house was built by Lordos Contracta in 2005 and comes with full title deeds. 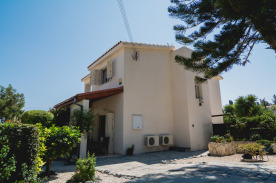 The property is situated on a quiet road at the top end of Episkopi village. The village is well supplied by tavernas, schools, supermarkets, doctors, dentists, chemists and veterinary clinics. The ancient city of Curium with its Roman theatre, popular beach and restaurants are only a 5-minute drive away. It takes 11 minutes by motorway to Limassol and 30 minutes to Paphos with its airport. 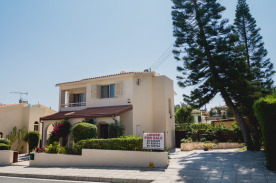 Larnaca airport is only 50 minutes away by airport shuttle buses. The house size is approximately 174 square metres of covered space and sits on a plot of 530 square metres. 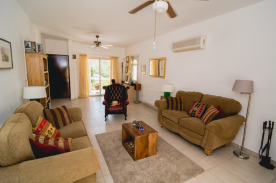 There is ample space for a swimming pool, although included with and adjacent to the property there is a large secluded pool and tennis court. 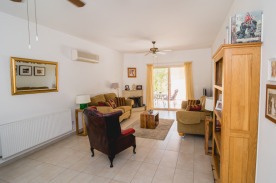 The pool area comes complete with fitted kitchen, BBQ’s (gas and charcoal), toilet facilities and tool shed. The facility is maintained by a few households who share the running costs by means of a small annual fee. DOWNSTAIRS. There is a lounge, (8X4 metres), dining room (4X3.5 metres), kitchen with granite worktops (4X3.9 metres) and a shower/toilet room. The lounge has an open fireplace. On the side of the house there is a storeroom containing the central heating boiler. Recently added covered patios frame the front and rear of the property. The house is surrounded by well maintained mature gardens in which there is a further covered patio, tool shed and BBQ. UPSTAIRS. There are three generously sized bedrooms, (measuring 4x4, 4.8x3.5 and 4x3.8 metres respectively). Each bedroom has high pitched ceilings and fitted wardrobes. All bedrooms lead out onto balconies. The larger rear balcony has sea views. In addition there is a family bathroom/shower and one of the bedrooms has a separate toilet/shower room. The house benefits from central heating and air conditioning throughout. All windows have metal shutters and fly screens. Internally the house is in good decorative order, whilst the exterior of the property has recently been painted with 2 coats of Dulux Weather Shield paint guaranteed for 12 years. This house is ready to move into without further work.